You want to know what has changed in the new title update? 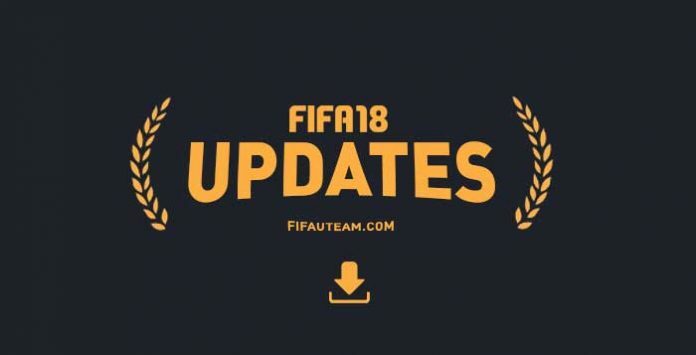 Find here in a single page the complete FIFA 18 Update history. This page is updated every time it is announced a new FIFA 18 Update. ✔️ Changes made to the team sheets in the FIFA World Cup Online Tournament will now save and persist between boot sessions. ✔️ Changes will be saved to a file called WC Online Squad Customization. ✔️ Removed the Cup window in the FIFA World Cup Online Tournament will no longer reset each week. ✔️ The Customize Controls and Game Settings tiles now work correctly with the settings defined in the Accessibility Settings screen. ✔️ Rarely the game would crash when attempting to rapidly progress through the FIFA World Cup Online Friendlies match flow. ✔️ A crash during the FIFA World Cup Ultimate Team club creation flow for some players. This crash would occur if the player selected a language when launching the game that did not match the default language selected in Origin. ✔️ Toggling between the two teams on the Player Ratings screen in the Pause Menu would sometimes cause the player heads to change size. ✔️ Accepting a game invite to another mode within FIFA, while in the FIFA World Cup Ultimate Team menus, was causing some visual corruption until the game was shut down and restarted. ✔️ Players sometimes getting an error message following the completion of the group stage of the FIFA World Cup Ultimate Team Online Tournament. ✔️ The Swap with duplicates option was not properly displaying on a Player Item in a Duplicate Storage if you had just sent another version of that Player Item to your Club. ✔️ Players getting an error message when attempting to send a duplicate Player Item to their Duplicate Storage after they have swapped that Item with an item in their Active Squad. ✔️ The latency bars were not properly displaying the latency to the server in the FIFA World Cup Ultimate Team Online Tournament mode. ✔️ Rarely the game would crash after entering and exiting FIFA Ultimate Team numerous times. ✔️ A crash when searching for a player that you had previously scouted on a different team if that player had been scouted by your 6th hired scout. ✔️ Rarely the game would crash if you suspended and resumed the game while in the Instant Replay screen. ✔️ Added new players to the qualified team’s rosters for use in all FIFA World Cup™ modes. ✔️ Added a check to ensure that the player is on the most up to date FIFA World Cup™ rosters after leaving any of the FIFA World Cup™ modes. ✔️ Seeing invalid squads available for selection in FIFA World Cup™ Kick Off when entering into the mode following multiple lead profile changes. ✔️ A crash after repeatedly selecting to restart a match in FIFA World Cup™ Kick Off. ✔️ Added the foundation that will allow for the addition of new players to FIFA World Cup™ Ultimate Team. ✔️ Backing out of the FIFA World Cup™ Ultimate Team club creation flow, when you had unclaimed items in FIFA Ultimate Team, would result in visual corruption. ✔️ Sometimes the chemistry chevrons on Player Items and Chemistry Style Items would incorrectly show full chevrons for all attributes. ✔️ A single player leaving a Pro Clubs Drop-In Match during the pre-match flow will no longer cause the match to end for all players. Access the FIFA World Cup™ features from the FIFA HUB. ✔️ When a Virtual Pro has hit the XP Growth Cap for an attribute, it will now correctly display that it has reached the max on the Overall Progress screen following a Pro Clubs Drop In, League or Cup Match. ✔️ Previously, Virtual Pros that had hit the XP Growth Cap for an attribute were still being shown as having earned progression for that attribute on the Overall Progress screen following a Pro Clubs Drop In, League or Cup Match. ✔️ When this happened, it had appeared as if the Virtual Pro was earning progression that was then no longer present upon returning to the Pro Clubs menus. ✔️ Changes to the Sevilla kits displayed in game. ✔️ FUT Champions Channel replays, for matches that ended early and resulted in a DNF, were sometimes incorrectly displaying which player received the loss. This was purely a visual issue on the FUT Champions Channel screens, and had no bearing on the results of the actual match. ✔️ The goals were visually missing from the pitch if the Net Shaping settings had been changed to something different than those used by the player’s active Stadium. ✔️ The ‘Camera Target’ buttons, displayed when watching a FUT Champions Channel replay, were displaying as controller buttons when using a keyboard. ✔️ The ‘Toggle Tabs’ buttons, displayed on the FUT New Items screen, were displaying as controller buttons when using a keyboard. They are now also clickable when using a mouse. ✔️ Changes to the Arsenal Tula banners displayed in game. ✔️ Changes to the Club America kits, crests and banners displayed in game. ✔️ Matches that ended early will, in most cases, now be available for viewing in FUT Champions Channel. ✔️ Custom kit numbers will no longer change after swapping players around in your squad. ✔️ Players will now always see their team on the left in the pre-match Team Management screens when playing a FUT Champions Weekend League match. ✔️ In FUT Champions Channel, the introduction of the Orbit camera in a previous update had inadvertently removed the slow (0.5x) playback speed. This has been added back as a playback option. ✔️ The Match Preview screen for FUT Champions Weekend League matches was sometimes showing the status of your opponent as blank instead of ‘Making Changes’. ✔️ When an action shot on a player item fails to load, it will now properly default to the player’s 2D portrait. ✔️ The wrong text was being highlighted in red, on player items, when a squad did not meet the requirements for the FUT Champions Daily Knockout Tournament due to either League or Nationality requirements. ✔️ A Pro Clubs Friendlies match that is tied at the end of full time will now progress into extra time (silver goal) and, if needed, penalties. ✔️ The on-screen pause button, when enabled through the Accessibility settings, was not working in Pro Clubs matches. ✔️ Updates to the Catfish and the Bottlemen kit in FUT. ✔️ The addition of an Accessibility Settings screen. ✔️ This is available in the Main Menu on the Customize tab by selecting the Settings tile. ✔️ The ability to add an on-screen, and clickable, ESC button during gameplay to allow for opening the Pause Menu using the mouse only. ✔️ The ability to increase the size of the clickable buttons within the game menus when using a mouse. ✔️ Pressing the D-pad, when using a controller, would occasionally not register. ✔️ In FUT Champions Weekend League, on the Match Preview screen, you will no longer see the status of your opponent update between “Making Changes” and “Ready”, it will always display as “Making Changes”. ✔️ Selecting the difficulty of a match in FUT Squad Battles will no longer cause the player’s default match difficulty setting outside of FUT Squad Battles to be changed. ✔️ In the preview panel for a FUT Champions Channel replay, the match records displayed for the participating players will now reflect their record when that match took place instead of their current record. ✔️ German and Polish text overlapping the button icons on the controls panel in FUT Champions Channel. ✔️ Player Contracts and Manager Contracts were incorrectly capitalized in the search filter options of the FUT Transfer Market. ✔️ Updates to the 2D portraits for 970 players. ✔️ Added 2d portraits for 342 players that previously had a silhouette. ✔️ After kickoff, the defending team will be more compact in defense. ✔️ Their attacking players will be less aggressive in pushing up the field. ✔️ Their defensive players will close the space between them and their attacking players to reduce the gap and limit the attacking team’s space. ✔️ Goalkeepers unnecessarily clearing the ball when it was passed to them in certain situations. ✔️ All matches will now take place in the FeWC Stadium, with the Time of Day always set to night and weather always set to clear. ✔️ The pre-match screens will no longer display which teams is the home team or away team; instead, players will always see their team on the left side of the screen, with their opponent’s team displaying on the right side. ✔️ You will no longer see your opponent’s kits in either gameplay or the pre-match screens; instead, you will see opponent wearing your unselected active kit. ✔️ The kit selection and match preview screens have been updated as a result of this change. ✔️ The orbit camera can now be used when watching FUT Champions Channel replays. ✔️ The player fitness and squad fitness search filters on the FUT Transfer Market not returning the correct items. ✔️ The player contracts and manager contract search filters on the FUT Transfer Market not returning the correct items. ✔️ The specialities displayed for some inform players, in the team management screens of a FUT online match, were incorrect. This was a visual issue only with no impact on gameplay. ✔️ A player’s Pro Clubs Virtual Pro having incorrect attributes if it was created when the player is not connected to the servers. ✔️ Updated to a number of kits. ✔️ A freeze happening, in some situations, during the goal celebration for a goal that was scored by the goalkeeper. ✔️ The goal celebration being skipped, in some situations, after a goal was scored by the goalkeeper. ✔️ Holding the sprint button will once again cause a goalkeeper to get up quickly if he is on the ground while holding the ball. ✔️ The player sometimes being in control of the wrong player in a Skill Game. ✔️ Stringing the juggle skill move together multiple times in the Practice Arena could cause your player to disappear. ✔️ Updated the default FIFA Trainer settings for the Intro Match to show both Movement and Mechanics instead of just Movement. ✔️ Added the ability to watch FUT Champions Channel replays in a slower (0.5x) playback speed. ✔️ When toggling the playback speed of the replay, it cycles through Normal –> Fast –> Slow. ✔️ Removed the Single Player Camera from the list of available camera angles in FUT Champions Channel. ✔️ Removed the non-functional Restart button in the FUT Champions Channel Pause Menu. ✔️ Renamed the FIWC Stadium item to FeWC Stadium. ✔️ FUT Squads that had default tactics values that were incorrectly set to over 100 have been reset to the normal default values. ✔️ A visual issue where sometimes the kit that a player selected to play with would not be the kit that their opponent would see them playing with in FUT Online modes. ✔️ The FUT Squad Battles Featured Squad image not loading properly after rapidly transitioning through screens. ✔️ The Pause Menu countdown timer sometimes displaying throughout a FUT Champions Channel replay. ✔️ The scrolling team lineup list sometimes displaying at the start of a FUT Champions Channel replay. ✔️ The penalty shootout tutorial sometimes displaying during a penalty shootout in a FUT Champions Channel replay. ✔️ Updates to the 2D portraits for some players. ✔️ Incorrect penalty calls where a defender legally wins a header but also collides with an attacking player. ✔️ Goalkeepers staying on the ground too long, not attempting to gather the ball, when the ball was within reach after a save. ✔️ Goalkeepers sometimes not going for the ball after a back pass. ✔️ This issue would occur more often if using manual passing. ✔️ Players getting a message that there are no attempts remaining in the current Daily Knockout Tournament when their final attempt is still active. ✔️ The game freezing when quickly selecting an opponent in Squad Battles immediately after getting to the Opponent Selection screen. ✔️ Corrected some of the text for the squad requirements in FUT Champions. ✔️ A visual issue with an incorrect overall player rating showing in the Player Performance screen of the Pause Menu in certain situations. ✔️ Added additional matchmaking regions in Pro Clubs. ✔️ Players being unable to make quick subs if they had used all their available pauses. ✔️ The trophy not being present in the Pro Clubs Championship celebration. ✔️ Captains disconnecting from Pro Clubs matches when Voice Chat is disabled via game launcher. ✔️ Players signed to pre-contracts, in the first season, not coming to your team if the first summer transfer window was disabled during Career Mode setup. ✔️ Some player attributes were missing from the Squad HUB. ✔️ The tournament tree in the Women’s International Cup being empty after the semifinals. ✔️ Repetitive whistling that was heard in some stadiums. ✔️ Some visual issues with the Bundesliga broadcast package. ✔️ Updates to a number of crests and kits. This means that the CPU team has an active player, just like you do, which is called the CPU AI controlled player. On a team with no human players. For example, the CPU controlled team in Squad Battles. On a team with human players who are all locked to specific players, that also has CPU teammates. For example, a Pro Clubs team, with less than 11 human players, with no ANY player. The passes impacted by this change will see: reduced ball speed; reduced accuracy. The goalkeeper diving too early on the downward header and volley shots. Minor fixes to improve the game stability. ✔️ Players will no longer be able to select a language when launching the game. The language used will be the language currently selected in Origin. Players can change this language within the Origin client. Added keyboard support for drop down menus and overlays. Typing in dropdown menus will navigate to the most relevant item. Esc and Enter keys will close/confirm overlays. Added a Close button and Previous/Next navigation to picker menus. Addressed an issue where tapping through overlays would register on other screen elements behind the overlay. Added support for Android O features (SDK 26). Moved the Buy Now button to the main bidding panel. In Squad Building Challenges, added a counter for rare player and quality requirements. In Squad Building Challenges, changed how the “or” requirements are displayed to make them more clear. Addressed Search and Reset button inconsistencies between different sections. Previously selected players in the Compare Price flow are now remembered. Automatic scrolling to the top of the page on Transfer Market and Unassigned screens when performing actions. Selected items will now stay in focus. Player images not showing on special pack art. Being unable to un-watch expired items in Transfer Targets. The Previous and Next buttons missing from default searches. Needing to confirm twice to view a shared squad link. A hang when opening a shared squad link. Para FIFA ,não é Palmeiras o maior vencedor do Brasil ? Eu Márcio acredito que a FIFA reconheça que o Palmeiras tem maior numero do Brasil em títulos e o Santos do tal do Pelé em segundo ….!!! !